On March 3rd Disneyland’s Indiana Jones Adventure, the Temple of the Forbidden Eye turned 20. Yes, the Indiana Jones attraction is 20 years old. I remember when when the attraction wasn’t even there! And I remember when it was being constructed, and guests could walk up to the imposing temple for a peek. We visited again the summer after the attraction opened and how absolutely terrified I was when I rode it for the first time! But it was fun none the less! To celebrate the 20th anniversary of the attraction, Disneyland hosted an exclusive, after hours party for annual passholders. For the event I was inspired by the attraction, and wore an “adventurer chic” outfit with elements of the attraction, including an eye of Mara pendant from the shortly lived Adventureland Trading Company adventure, and a cobra belt, as the attraction features a giant cobra. The party offered live entertainment with bands, fortune tellers and, best of all, a special presentation with Disney historian Tim O’Day and Disney Imagineer and Legend Tony Baxter to discuss the development of the attraction. Baxter is one of my favorite behind the scenes Disney guys, and I’ve even labeled myself a Tony Baxter fangirl on occasion, because his credits include some of my favorite attractions at Disneyland, including Big Thunder Mountain Railroad, the development of New Fantasyland, and of course Indiana Jones. It should also be noted Baxter started his Disney career scooping ice cream! Baxter and O’Day shared with us the many ideas were discussed in the attraction’s infancy, showcased concept art, photographs of models (including outlandish plans to integrate the Jungle Cruise and Disneyland Railroad) and the technology that was developed for the attraction. When the attraction first opened, Guests were given cards to aid in deciphering the Maragliphics (named after Mara whose temple it is) that adorned the walls of the temple. The cards were discontinued, finding their ways into antique shops with dealers who specialized in Disneyland memorabilia, or Ebay, and soon the strange writings on the wall were left to be thought of as just decor. But for the celebration, Guests were given the card again! And could once again decipher the various warnings and hidden gems throughout the attraction’s queue, including a room that features the initials of those who worked on the attraction. It was an exciting and fun night, and I was thrilled to be able to see one of my favorite Disneyland legends in person, and speaking about one of my all-time favorite attractions. Coat by Desert Suedes: Some antique mall in California, I don’t recall! The mall was called “Antiques at the Market” 🙂 PS that blouse is marvelous!! Your outfit is absolutely perfect! I’d have to say that my most favorite accessory is the belt. And the skirt you made is lovely! I can’t believethe ride is 2O years old now! It’s been over five years since I last went to Disneyland; I’ll definitely be saving up because I miss this and many other rides. P.S: I love little secrets like the decoder! That belt, that jacket, that necklace, that coat, my goodness, I’m in love with it all – very, very much including the overall colour palette of warm earth tones, too. 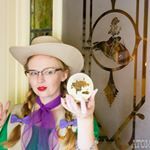 You always rock the most amazing adventurer inspired looks and make me want to go on an old-timey archaeological dig and if that’s not possible (which, time travel being annoyingly non-existent) then to definitely trek my way to Disneyland some day. What a perfect outfit for that event! Sounds like so much fun. I really love the adventurer chic look! Very cute, fun, appropriate, and (I’m guessing) comfortable. Those cards sound like so much fun, too – I’m sure all I’d want to do after getting one would be running around trying to read the walls. Such a cool idea. Wonderful outfit! I missed a little bit your fabulous travellers/adventure looks the past months. S, thanks to Indiana Jones.